With one of these mirrors in my hand I looked amongst the urns, thinking meanwhile, ‘Maybe chance has preserved amongst these remains some part of the dust from the fine eyes of a Greek or a Roman lady, who so many centuries ago surveyed herself in this mirror…’ Nor could I restrain my desire to touch the ashes of an urn on which a female figure was being mourned. I felt it gently, with great feeling…I pressed the grain of dust between my fingers tenderly, just as her best friend might once have grasped her hand. It may surprise many today that de la Roche was allowed to handle museum objects at all, but in fact this was not unusual in the seventeenth and eighteenth centuries. This couldn’t be further away from the experience of today’s museum visitors, who, ever under the watchful eye of security guards and staff, are constantly reminded by museum signage: Do Not Touch. The museum has, over time, become a primarily visual site. As a ‘distance’ sense, vision tends to encourage a certain degree of detachment from the objects that we observe. Touch, on the other hand, physically connects us with our material environment and thus provides a greater immediacy of experience. It allows us both to better know objects through manual exploration of their material properties, and offers a more emotive or intimate experience of the things around us, as illustrated in de la Roche’s account. Throughout my research, I have adopted a tactile approach as a particularly apt method of investigation of the Wellcome Collection tattooed skins. First, I am struck by their visual characteristics. On looking, the skin may at first appear as a flat parchment surface, an impression that is reinforced by the presence of the tattoo. 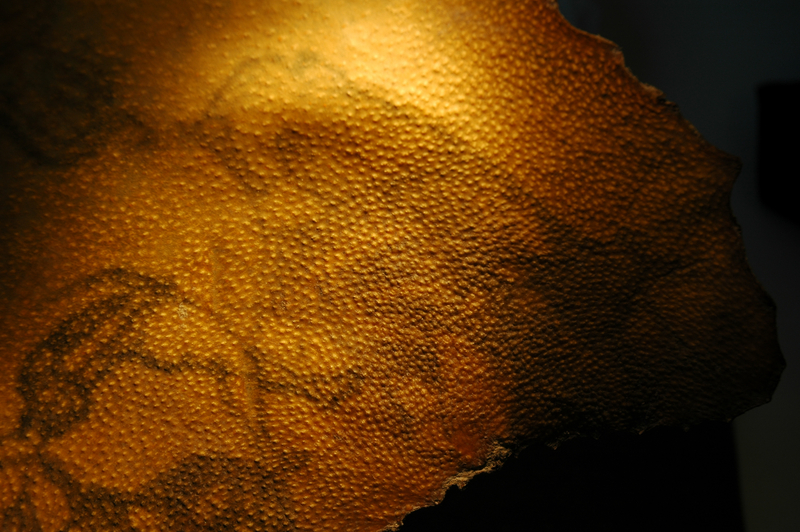 But whilst I may initially perceive the tattooed skin as a surface – fragile, papery, and brittle – my visual apprehension of its texture compels me to verify these impressions manually. On picking the skin up between my fingers, testing its weight and pliability, turning it over in my hand and observing its grooves and contours, it may defy my initial expectations – it may be tough, bark-like and opaque, or leathery, soft and powdery. It is not a flat surface but a multidimensional object which reveals its human origins in an array of surface features such as hairs, punctures, capillaries, fascia, scars, lesions, and of course, the tattoo. Tattooed human skin (Object no. A576), showing rigor mortis in the arrector pili muscles of the skin. What appears here as ‘goose-flesh’ – a skin sensation associated with both surface feelings of cold and visceral fear or horror – is frozen in the moment of death through the speedy preservation of the excised fragment. What I am actually seeing and feeling as I examine this skin is the presence of a very familiar living skin-sensation – except in this case it is caused by rigor mortis of the arrector pili muscles in the dermis. My own skin prickles at the thought. This specimen was likely removed in haste, soon after death and under rudimentary surgical conditions. Thus the texture reveals a trace of the death of the individual, whilst evoking a profoundly visceral response through my tactile engagement with the skin itself. I ask myself who this person was, what life he led, why did he choose to mark himself with these tattoos? The skin ceases to be a mere ‘object’. In a sense, touching brings the subject back to life. Cited in Classen, Constance: The Book of Touch, (2005) pp.227-8. This entry was posted in Museum Collections, Sensory Anthropology and tagged human remains, phenomenology, preserved tattooed skin, skin, tactility, tattooed skin collection, texture, touch. Bookmark the permalink.